Making breakfast for a large crowd is tiring! We usually only have a full house a couple times a year and it’s mainly around the holidays. Instead of slaving over the stove making multiple batches of scrambled eggs, I can get them done in one shot when I prepare them in the oven. 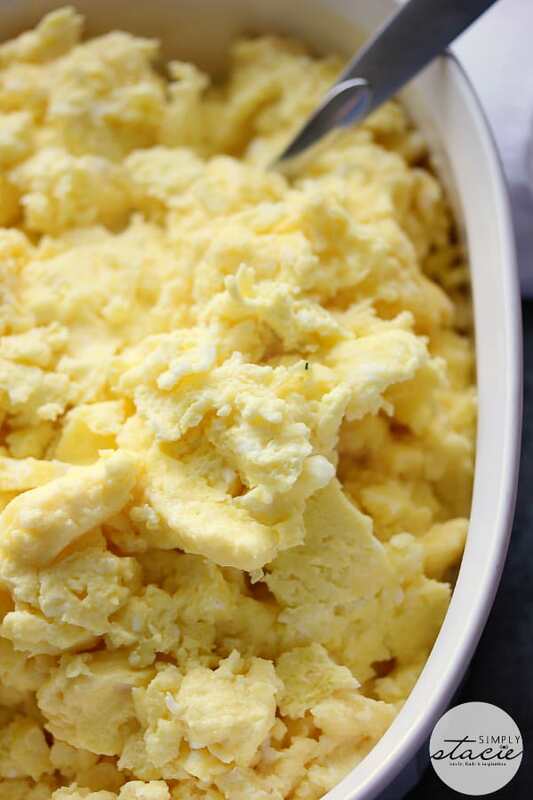 The result is deliciously creamy scrambled eggs cooked to perfection. They also are piping hot! I despise eating cold eggs. You can prepare the white sauce the night before and store in the fridge. In the morning, put it in the microwave to get it to room temperature. 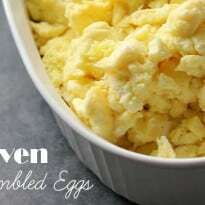 This recipe is the way to go when preparing scrambled eggs for a crowd! It’s the only way I make them when we have company over. For more egg recipes, check out the following posts: Spinach & Cheese Egg Muffins and Ham & Eggs in a Muffin Tin. 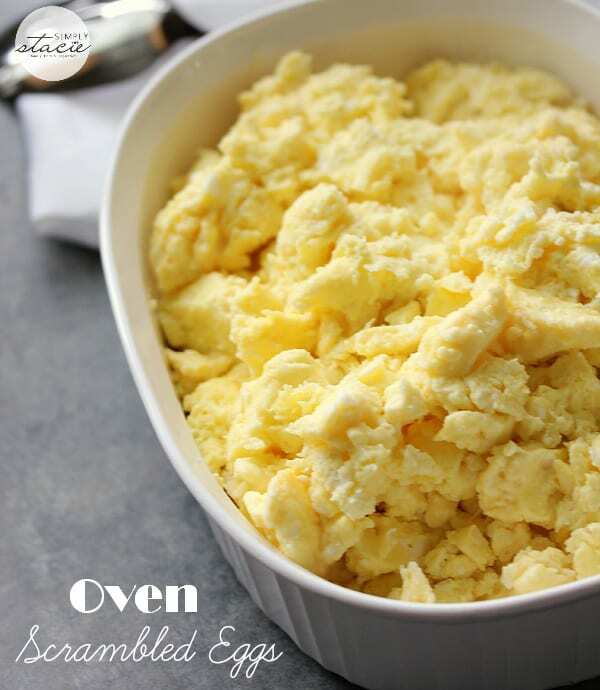 Have you ever made scrambled eggs in the oven? In a saucepan on the stove, melt 3 tbsp butter over medium heat. Add in the flour and salt and stir constantly for 3 minutes. Gradually add in cream while whisking. Whisk constantly till sauce comes to a boil and is thick. Remove from heat and cover in plastic wrap. Place in freezer to bring the mixture to room temperature (about 8 to 10 minutes). Preheat oven to 400°F. Whisk eggs in a large bowl and in cooled cream mixture. Whisk together. Pour egg mixture into a greased baking pan. Cook uncovered for 10 minutes and then stir the mixture with a spatula. Cook another 5 minutes and then stir again. Repeat the process until eggs are cooked and reach the desired firmness. Season with salt and pepper to taste. This will be such a relief (for me) when the holidays roll in or when family visits. Can’t wait to try this recipe. Thank you for sharing! This looks so delicious! I am definitely trying this out.When my family all gets together there are seven adults and ten grandchildren.This will do the trick and it looks easy.Thank you Stacie. When our family gets together there are seven adults and eleven grandchildren so this will come in handy.It looks amazing and easy too.Thank you Stacie. I would have never thought it was so easy! I can’t wait to try it in the morning! Awesome idea for me to make on x-mas morning. It would save me so much time and free me up for other things that need a lot of attention. I’m always looking for new breakfast recipes. This one looks super simple ans is one I will be trying in the near future. Is the flour nessesary? I need them to be gluten free. You could leave it out and it will still work. Had these this am fast, simple and delicious!